Nerdtour 2012: T-minus 35 days and counting, some thoughts… – Nerdwatch! Now that the obligatory begging and passing the hat is done, here are some thoughts about why I’m going to Japan. The statue above is of Inou Tadataka, a Japanese man who “retired” from his family sake business at 49, studied Western astronomy, geography, and mathematics for 6 years, and then set out on foot to make a map of the whole of Japan. For the next 18 years he worked on it, walking all over the islands, taking extremely accurate measurements, and created the first real map of Japan. He didn’t live to finish it, he died when he was 74 in 1818, but his team finished the map for him 3 years later. His maps were so accurate they were used up until the 1920’s. There are no complete copies of his maps left, they were mostly destroyed in the firebombing in WWII, but there is a mostly complete version in the US Library of Congress, which I hope to see someday. I claim him as a role model, since he decided to take on a completely new profession when he was the age when many men were winding up their affairs. My brother was like this, he became a registered nurse at about the same age, and our Dad went through a half-dozen different “careers” in his life. I started studying Japanese when I was 49, and I’m trying to figure out how to make a living out of going to Japan and blogging and taking photos. I’ve had a good run as a software developer, but it’s time to move on. One neat thing about him, he used to live in the same neighborhood where I’m going to be staying, Monzennakacho. 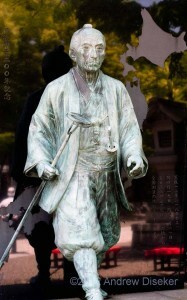 The statue is in the courtyard of the Fukagawa shrine nearby, and every time he set out for a survey, he would stop at the shrine. One year a group of senior men decided to re-create one of his surveys, the men started and ended at the Fukagawa shrine, they walked all around Japan, just like Tadataka, most of them well over 50. If I can end up giving half that much dedication, devotion, energy and will-power to this effort, I’ll be doing good. At any rate, the time is starting to pass more quickly, as the take-off day draws near! Tagged career, Inou Tadataka, Japan, mid-life, Monzennakacho, nerdtour, Nerdtour 2012. Bookmark the permalink.